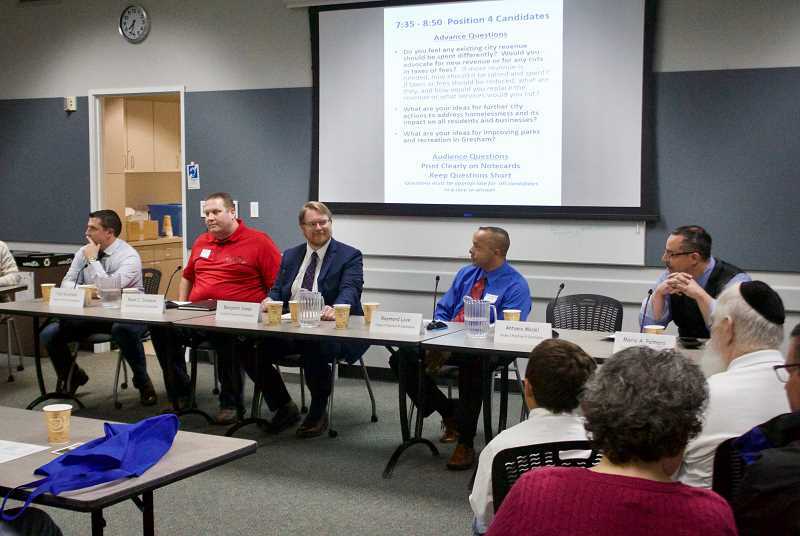 The many candidates running for three open Gresham City Council seats came together to talk about the issues during a forum Tuesday evening, Oct. 23, hosted by the Coalition of Gresham Neighborhood Associations at City Hall. The candidates for Council Position 2, incumbent Kirk French and Eddy Morales, both attended, as did all but one of the candidates for Council Position 4 — incumbent Mario Palmero, Paul Drechsler, Benjamin Jones, Ryan Johnson and Raymond Love. Antonio Medel did not attend. Finally, incumbent Janine Gladfelter, who is running unopposed for Council Position 6, was at the forum. THE OUTLOOK: Do you feel any existing revenue should be spent differently? KIRK FRENCH: We ask (the community) what you need, and take your ideas to form a Council Work Plan. When the city manager says we can't do what we need to do, we need to increase funding. 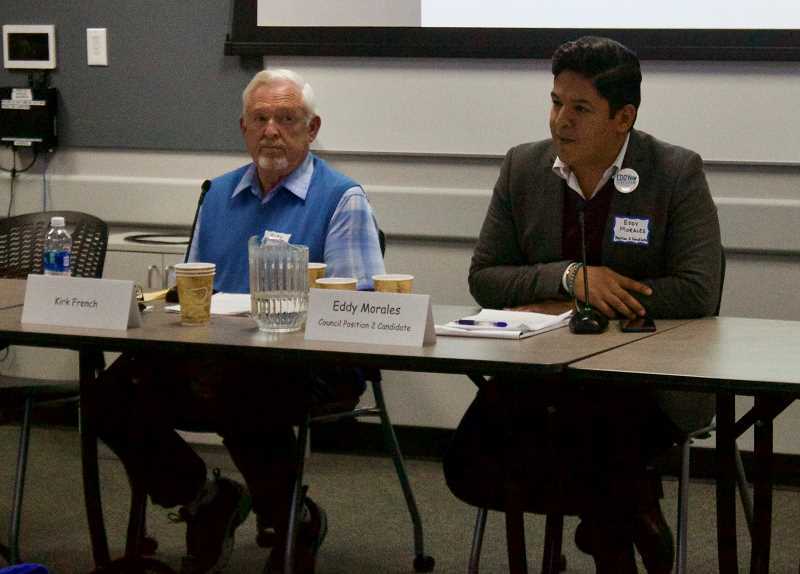 EDDY MORALES: We need to talk about property tax increases, and look at how we get revenue. Spending significant amounts to attract large corporations, instead we could use that to fund and support livability. OUTLOOK: What are your ideas for further city actions to address homelessness? FRENCH: We had the homeless task force, and created the homeless services specialist in cooperation with Multnomah County. That fella is serving 300 people, and the success rate is 80 percent. Now the city has a second person in that role. I would advocate for more help from Salem. MORALES: We talk about this as an unsolvable problem, but it's not, there are 600 homeless people in the region, 40 percent that are women. There aren't enough services available, and we can't turn away people looking for help in East County. We need more resources, mental health, and trade worker training to get them into stable jobs. OUTLOOK: What are your ideas for improving parks and recreation? FRENCH: We don't have it for the parks. We need to at least put out one master plan a year until we can get them all done. Make sure we replace park equipment, and in terms of funding I recommend forming a parks task force. MORALES: We should have a Parks and Recreation department in our city. Although we allocate money, we could do better in being equitable in the distribution. Places with low-income people need parks, sidewalks and roads. OUTLOOK: How would you protect and work with minorities in the community? FRENCH: I believe in opportunities for everybody. Whatever it takes to sit down with and listen to people to get the job done. MORALES: We have to get people who represent those communities at the table where decisions are made. As someone who is openly gay, a person of color and a son of immigrants, I walk that every day. We need to proclaim ourselves as the sanctuary city that we are. OUTLOOK: How would you approach crime and safety in Gresham? FRENCH: We have a (Neighborhood Enforcement Team) focused on community policing. They have made a difference, knocking on doors and asking questions first. Crime is terrible, and we need to work together. When you see something, report it. MORALES: We can police and not get to the root of the problem. We can get people to care about the community by giving them housing security and other investments like alternatives for young people." OUTLOOK: Do you feel any existing revenue should be spent differently? RAYMOND LOVE: When I looked at the city's budget, the lack of leadership struck me. You have to start with the basics. We have more money going to service debt than the police department. MARIO PALMERO: Our city is one of the leanest in East County with a lack of amenities, like a community center. I would ask citizens for (a) new tax levy for safety, and remove the $15 fee on the water bills. We also need an independent auditor. PAUL DRECHSLER: We are running lean and we have a lot of needs. I wouldn't make any cuts. Our grant amounts are moving down, and we need to work on our infrastructure. BENJAMIN JONES: The city is running a deficit, which is not ideal but not necessarily a bad thing. We can't afford to cut any taxes or fees. The city doesn't need to increase revenues. RYAN JOHNSON: The city seems to be managing taxpayer money well. We need to maximize our revenue by looking at the vendors and sellers we are using. LOVE: There are a lot of smart people around the country with ideas we can use. There has been an improvement in Gresham, especially on the Springwater Corridor Trail. PALMERO: We had a homeless task force, which I was a part of. We need more housing for seniors and low-income. There is a serious lack of livable wage jobs in East County. We need to focus on vocational training. DRECHSLER: We aren't Portland, we aren't going to allow parks to be taken over by camping. It's a nuanced problem, not all of it is mental health. We need to build more housing in the city." JONES: Homelessness is an issue that I want to tackle. Not combating homelessness, we don't need to do that to people who have lost something. We need to look at other success stories, we don't need to reinvent the wheel. JOHNSON: I feel the city having a homeless services specialist is a huge step. We need to form a new homeless task force. LOVE: My son's soccer team would love some (portable toilets) at the parks where they play. There are some great programs out there we could use, like having kids from schools participate in maintaining parks. PALMERO: We need to invest in a feasibility study for a parks district. We need to see how to fund it. We also need a community center that we can pay for with the sale of recreational marijuana. DRECHSLER: We need more parks for our kids. We have failed to develop purchased lands for 30 years. We have to allow neighborhoods to move forward by forming master plans to get grants. JONES: We should create ways to think outside the box, like a park sponsorship program with donors who can improve parks and provide revenue. We need better outreach to connect our parks with the community. JOHNSON: I would recommend a task force on parks — I am a big fan of task forces. Get the Neighborhood Associations involved to see what people want changed, and reach out to volunteers who work in the parks. OUTLOOK: What needs to be done to address poverty in the city? LOVE: We need to allocate resources properly and find out what the real need is. I'm not a fan of putting up buildings that are only affordable housing. We need to discuss the Urban Growth Boundary and how we use our land. PALMERO: We need to keep people housed and stop them from becoming homeless. They shouldn't have to choose between buying medication and paying for their water bill." DRECHSLER: Most people want opportunities, and Rockwood Rising is creating a place where people can learn skills and start a business. People want to be successful. JONES: You can have housing for people, but it needs to be affordable. We need to get jobs into Gresham, and make sure there are small businesses getting into these empty spaces." JOHNSON: Everybody has their own needs, so you can't categorize them all together. You have to figure out what programs to steer them toward." Gladfelter also answered the three prearranged questions and spoke about why she is running for reelection. She said that while the bulk of the budget is going toward fire and police, she wants more funding for parks and recreation. Gladfelter wants the city to generate more funds, and collaborate with other groups to find solutions. Gladfelter said she wants to be an advocate for getting more support to the homeless community. "Many circumstances cause homelessness," she said. "We need to proceed with heart and maintain neighborhood livability." Finally, she wants to continue to build on a good start to the parks issue. "We need to get a list on everything that is needed in our parks so we can start doing the small things," Gladfelter said. "The master plans will allow people to go for grants."